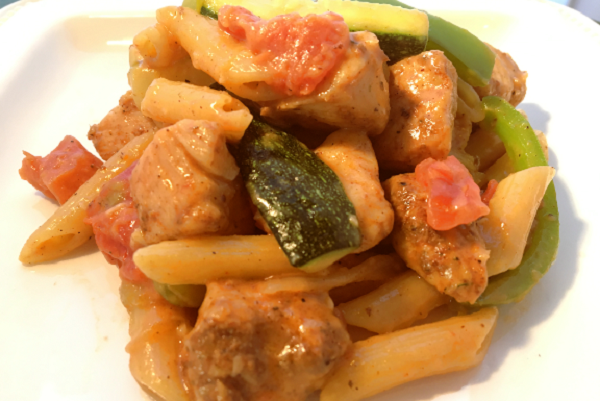 Penne pasta tossed in a cream sauce with fajita spiced chicken and veggies. Tex-Mex meets Italian for a fast and easy weeknight fusion dinner. Coat a pan with oil and heat on medium high heat. Saute chicken until brown and cooked through 5-8 minutes then set aside. Saute onions for 2 mins, bell peppers for 1 min, zucchini for 2-3 mins. Add sauce to a second sauce pan and bring to a boil. Add in the penne pasta and simmer on low heat for 10-15 minutes until tender. Add chicken & veggies for 1-2 mins then serve. 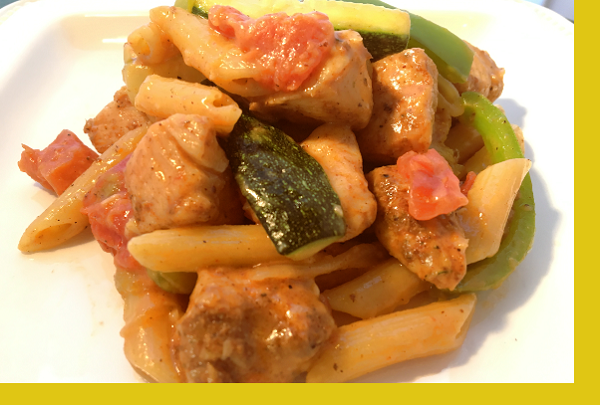 I love pasta, but I should say that Maria's chicken Fajita spiced Pasta with veggies is a perfect meal. Delicious, easy and quick to prepare. It is always on my list of 'food to order' from her. We had this last night and enjoyed it. It was a different taste but the flavors were good. We've had this twice now, and it's been amazing both times. For one, it's easy-- even the pasta has already been cooked to al dente for you. The chicken is tender, and the sauce is full of flavor. We ordered double the second time so we could have it two nights in a row.